A Max Caliber Daughter out of a Super Bowl Daughter. She is gentle and will eat cubes out of your hand. This is a great young cow. Tigress, is really gentle and raises a good calf. 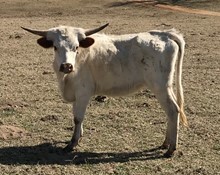 She has a very nice pedigree and is tracking to 80 inches Tip to Tip horn at maturity. She had a WO Iron Dust heifer calf on 1/14/18. This is a great pair. 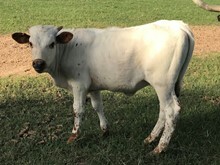 She is open to breed to the bull of your choice.